On the other hand, a cold winter in the northeast US shows that global warming is an obvious hoax. Or something. So what he's trying to say is that this is the warmest ice age we ever had? Given the coming temperature rise, perhaps someday future generations will look back at 2015 and say "That was during the last (as in final, not most recent) ice age". Wonder what he defines as easy? With strictly natural variability the odds of a record hot year from 1880 when records began is 1 in 135 isn't it? Not too easy if you ask me. Furthermore. the odds of having three hottest years in ten years i.e. 2005, 2010, 2014, is 1 in 3,341. Yup, easy I say! If you had a cycle, you'd have brief periods at the peak where you're likely to break heat records, and long periods where you're very unlikely to break them. So your calculation doesn't work when looking just at the data. Particularly not if you decide that this increase is just part of a cycle. It's impossible from a data set to distinguish a perpetual increase from the start of a cycle, so that decision is consistent with the data. It is inconsistent with the physics, but when has that ever stopped WUWT denizens? Okay, so let's say that 1998 started the new norm, then the odds for a record breaking year would be 1 in 17. Easier, yes, but not all that easy. If I did my math right, having 2005, 2010, and 2014 breaking records over 1998 would still be about 1 in 1,428. I'm pretty sure your math is not doing what you think it's doing. A normally distributed series should have on average 2.7 records in 17 samples. So getting three records is the most likely number. Worse, global temperatures aren't drawn iid from a normal distribution, there's correlation between the draws -- so that makes having multiple records even more likely. Worse^2, if you make the unphysical assumption that we're at the peak of a cycle today, that means that the past 17 years, we've been slowly warming, so that even more increases the probability of having multiple records. I prefer "hiatus hiatus" personally. It reflects denier "logic" ever so much better for me. Actually, I think he has a point. Let's say temps have risen quite a bit over a long period of time. (As they have.) They will then be at a high point. Then let's say that temps stay relatively stable, with minor fluctuations above and below that point of stability, for a certain stretch of time. The downward fluctuations will not set new record lows because the long-term increase has brought temps to a very high level, far above the historical lows. But the upward fluctuations will set new record highs pretty easily, even in the context of overall stability, because we are so close to the record highs that even small upward fluctuations can surpass them. I hate to give Mr. Tisdale any credit, but if he meant what I just said, then he has a point. Of course, he misses the larger point: It is the long-term trend which counts when it comes to global warming. The fact that temps are hovering around the record highs and nowhere near the record lows is clear evidence of global warming. A short-term slowdown in the upward trend, assuming it even proves to be real, means nothing, other than that over shorter periods of time, there are other factors which come into play. 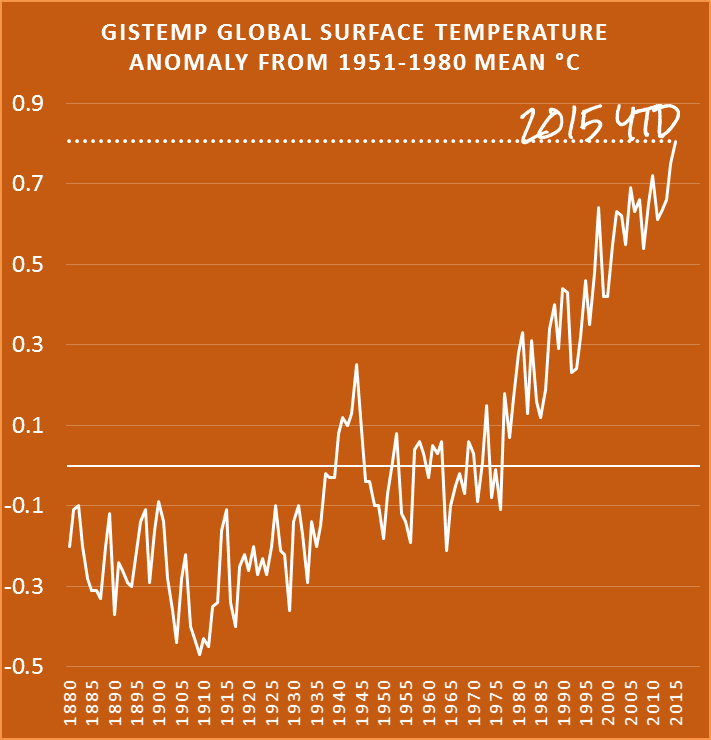 Keep your eye on the long-term trend and you'll never be distracted by denier's arguments. I hear what you're saying David. A couple of points though. If warming is happening more quickly, if the warming trend is steeper, then the chance of any year being the hottest would probably be greater than if warming has slowed. That is, given the year to year variability of the system. Of course that needn't hold. It could be that one year is hugely warmer than the previous hottest in a steep trend, and one year is only marginally warmer than the previous hottest in a less steep trend. While the number of "hottest" years is the same in both trends. If there's a "pause" rather than a slowdown it would hold however. And if it's not warming (as some deniers argue) or if it's cooling (as some deniers argue - sometimes the same ones), then the surface temperature should be staying the same or dropping - it shouldn't be hitting new records as often as it is. BTW AFAIK, Bob's a greenhouse effect denier. He thinks global warming is caused by blobs and El Ninos. He doesn't go as far as working out why blobs of hot ocean appear, or why each El Nino is hotter than the one before. As long as he keeps deniers happy, that's the main thing. It doesn't have to make sense.
" But the upward fluctuations will set new record highs pretty easily, even in the context of overall stability, because we are so close to the record highs that even small upward fluctuations can surpass them." Pretty easily...why? If we are pretty easily setting new record highs, then we are not stable or in a pause or hiatus. That should be pretty easily obvious. In order to set a new record you have to surpass the last, which time's arrow suggests is before the new one. When Skeptical Science came up with the "Escalator" graphic a few years back, the message was supposed to be clear that only by ignoring the segments where temperature anomaly went up could one see hiatuses. In something of a bizarre turn, Tisdale seems to really adopt that perspective, that is, the upward jumps are "a natural sunlight fueled El Nino . . ." and the steps are a hiatus between such jumps. From this point of view the probability of a record year is largely dependent upon the length of the hiatus/escalator step, not the length of the full record. It's not clear how he reconciles the fact that the escalator goes up, but never goes down in this philosophy, but the statement isn't inconsistent with his perspective. It's silly, of course, but silly in a predictable way. Your argument depends on '98 being the peak of warming to that point rather than the outlier we know it to be. You should really take the trend figure for that year as the start point, and if there's been no trend since (the hiatus) the chances of an outlier being exceeded three times in 17 years, soon to be four in 18, have to be pretty damn small. The only thing that Tisdale finds easy is self-deception. This idea that it is 'easy' to have record highs in a hiatus is nowhere given any justification, physical explanation, workings, numbers...nothing. Yet somehow 'alarmists' have forgotten something.. The man is little more than a monkey with a graph generator. The essential El Nino behavior is related to the mechanisms behind ENSO and the Quasi-Biennial Oscillations (QBO) of the upper atmospheric winds, These are forced by the periodicity established by the lunar and solar orbits. This mechanism hasn't changed over time and is not expected to in the future. So of course Tisdale is wrong in in his assertions, which should not be a surprise. Politics will always trump science for idealogues like Tisdale. Unfortunately Tisdale has littered the internet with cheese bait in the form of meaningless "graphs". Years from now, unsuspecting Google-offspring will still find these images fouling up the web much like the Pacific garbage patch does to the ocean today. Not to mention that it is fairly well understood that this natural variability accounts for roughly +/- 0.15 degrees C in temperature swings. So what is the expected anomaly for this year? 0.85 degrees or so? Hmmm...so where's that other 0.7 degrees coming from? It is interesting that Bob Tisdale keeps presenting evidence for global warming, ignoring his attempt at distraction by using a Gish Gallop. I disagree that it is easy to get a new record high during a slow down. The reason it is easy to get a new high is because there is a warming trend. If the warming was just a statistical abberation, then it stands to reason that cooler years are more likely due to the regression to the mean. It is telling that he uses HadCRUT4 for his observation vs projection comparisons. If you suspect this is a cherry-pick, you are right.